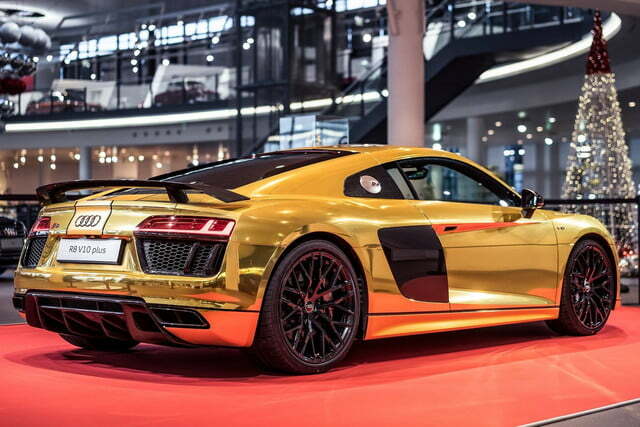 When Audi wins an award, the German brand does it big. 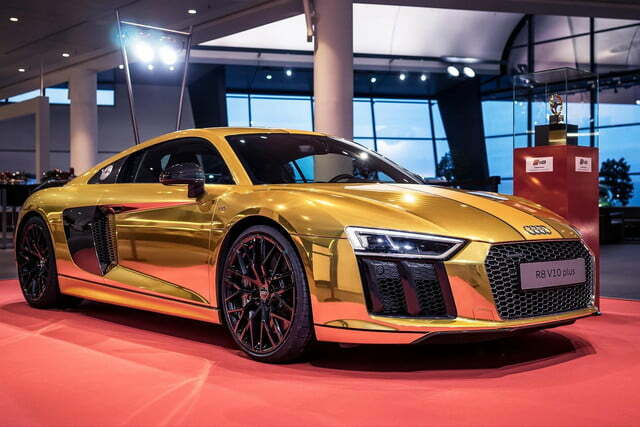 After garnering the Golden Steering Wheel accolade from German Magazine Auto Bild, the automaker decided to give an R8 V10 Plus a special gold chrome wrap to match the award trophy, resulting in a supercar that is truly worthy of royalty. Golden Steering Wheel recipients are chosen from a jury of readers, designers, racing drivers, and others experts, with the goal of naming the best and most impressive vehicles of the last 12 months. 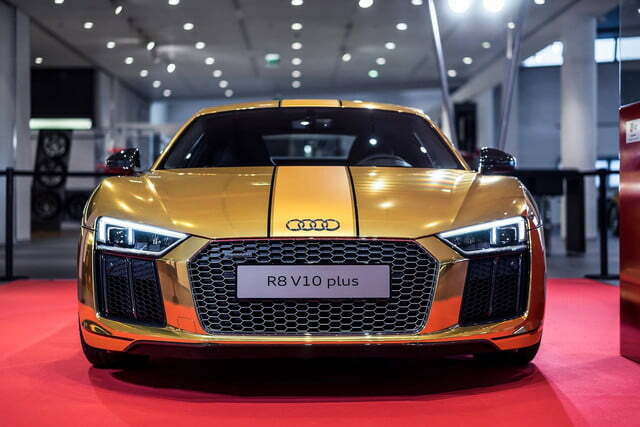 The R8, which entered its second generation for the 2017 model year, fits the bill perfectly. The mid-engine two-door ditched its V8 option for 2017 and focused all its energy on the stout 5.2-liter V10 sitting behind the driver. In standard guise, the powerplant puts out 540 horsepower and 398 pound-feet of torque, but the carbon fiber-laden V10 Plus version reaches its full potential of 610 hp and 413 lb-ft. Flat out, it’ll sprint from 0 to 60 mph in just 3.2 seconds, and its supreme balance and cat-like agility make it one of the most usable yet thrilling cars in the world. 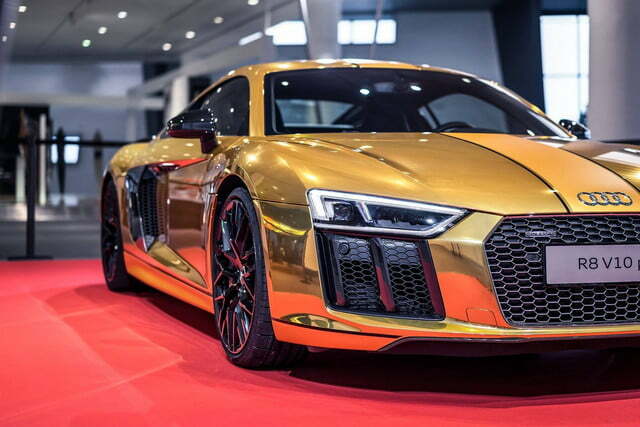 This isn’t the first gold car we’ve covered on DT and it won’t be the last, but the stunning R8 lends itself to a Midas-like coating more than most. 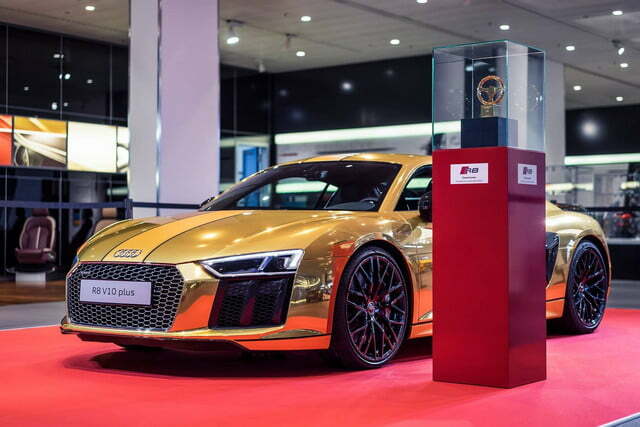 The eye-catching coupe is currently on display at the Audi Forum in Neckarsulm, Germany. It’s not all good news for R8 fans though, because after a test drive in the U.K. went wrong, it looks like there will be one less example to lust after. According to Instagram user lovedbeard, a customer went to a dealership to try out a bright yellow V10 Plus, but ended up clipping a curb and flipping the vehicle on its roof. Details of the accident are slim at the moment, but it’s been reported that the driver suffered no serious injuries. 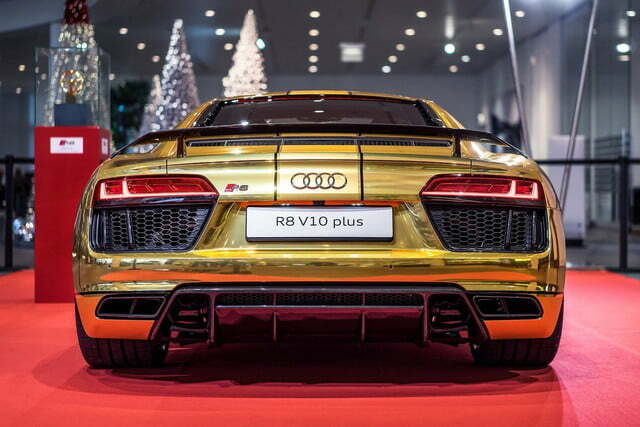 The R8, however, is likely beyond repair. See photos of the wreck here.